I think I’ll have to say yes, for now. What we have so far is a little bit like Satoshi Kon territory: a story about the blurring between reality and fantasy (delusional fantasy, in this case), and like in Higurashi the most innocent looking things can hide something sinister. The protagonist, Takumi, is right to be suspicious of the fawning, fangirl Yua who follows him home. 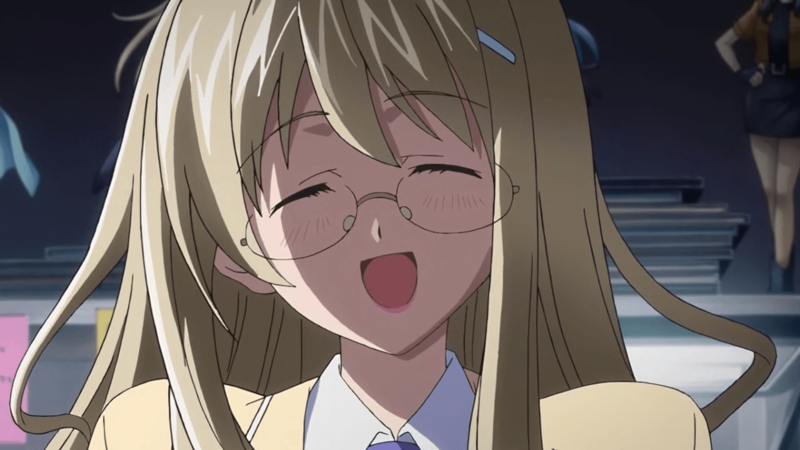 She is definitely no Nogizaka Haruka; in shows of this sort ulterior motives are to be taken for granted. Having watched a bunch of old X-Files episodes lately, its old mantra “trust no one” came to my mind: whether it’s Takumi’s own fantasies of his Seira figurines coming to life or even his memory of someone being killed in an alleyway–by a girl who ends up sitting next to him in class. Heck, for a while I was even doubting that his little sister was real, because she too seemed very much like the “anime imouto” for a while. It’s as if he were stuck inside a cliche dating sim the whole time, aside from the murders of course. And, knowing a little about its source material, this is undoubtedly a prelude toward something more disturbing. It’s like Welcome to the NHK in that the protagonist is also a bit of a shut-in, and it seems that it will begin to take a darker look at the otaku life–and, of course, the all round mood of paranoia that characterized the earlier episodes. Takumi has a lot of time compared to Satou, of course; he still goes to school and appears to have one friend there. But the size and nature of his collection is very adult otaku rather than teenage, it seems to me, and one could easily see him as a hikikomori in due time. His fractured emotional state leads me to think that we are going to be presented with an unreliable narrator, and that the tension and appeal of the show will be in part due to the uncertainty of what is “real” and what is not when it comes to the murders. Chaos; Head strikes me as being one of the season’s more unique offerings. I hope it takes us in unexpected directions. I may even add it to my regular blogging schedules–I realize now that I’ve been blogging sequels up to this point and I guess it’s time for something new. We’ll see. Tomorrow: big roundup of everything else I’ve seen this season. I found this episode to be a bit frustrating to be honest. I could see the potential here – I noticed the NHK no Youkouso and Perfect Blue comparisons, same as you – but the hyperactive moe girls didn’t sit right with the mixture of otaku social commentary, Lain-esque weirdness and gritty backgrounds; the slapstick, saucer eyes and garish colours just felt out of place next to the suspense and gore. If the story starts to take itself seriously, I’ll eat my words. I certainly hope so, because I agree that this is a bit different from the other Autumn offerings. Juxtaposing hawt, moe girls with violent, graphic deaths and psychological trauma? What’s not to like? Sorry to take so long. This is also partly a test of the more modern commenting system I just installed…consider that my excuse! @Martin: I still have yet to see episode 2, so I’m wondering if it will continue its fascination. I’ve seen way too many shows where the quality simply deteriorated over time or it was too ambitious for its own good (hello, Noein and quite possible Kure-nai). Then again, if your issue is the juxtaposition of the cute/moe stuff and horror…it’s something that I had a hard time accepting too, until I saw Higurashi. 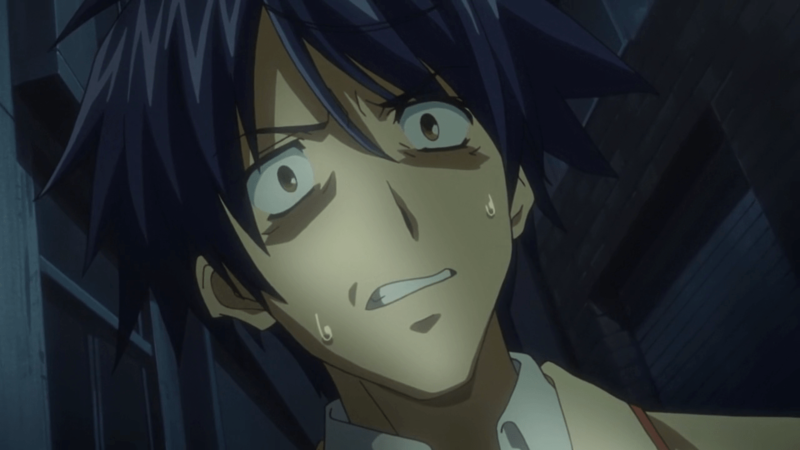 @Omismyth: I see you are probably a Higurashi fan, too. So am I. So am I.